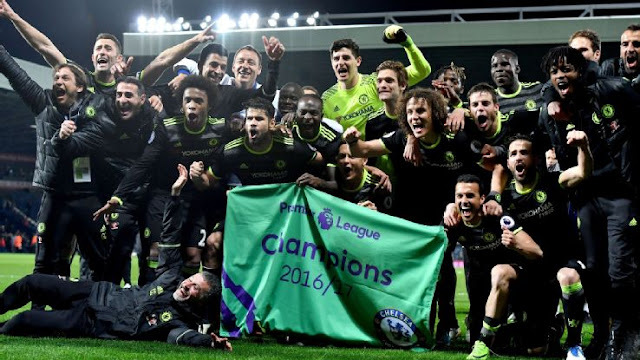 Chelsea have emerged as English Premier League champions for the 2016/2017 after they beat West Bromwich Albion 1-0 at the Hawthorns. A strike from Mitchy Batshuayi was enough to grab Antonio Conte’s men their second title in 3 years. Chelsea who had come into the game 7 points clear of title rivals-Tottenham needed a win over a resilient West Brom in order to win the title with 2 games left to play. Chelsea had in the match missed some great chances in the game which had their fans frustrated, but Antonio Conte brought in Willian and Batshuayi late in the match and his changes made the difference as Mitchy Batshuayi went on to strike home the winner in the 82nd minute to give the Blues a hard fought victory over West Brom. Chelsea still have a chance of completing the league and cup double when they face Arsenal in the FA cup Final on May 27 at Wembley.